Do you really need THAT funding type, if any at all? Equity funding is often the number one choice for entrepreneurs who are looking to expand their businesses, but we at the Business Funding Show realise that it can be particularly difficult finding your way around the equity funding jungle. That's why we are bringing you the Investment Conference next week, on Tuesday Nov 13, in celebration of Global Entrepreneurship Week! With plenty of opportunity for networking, you will be able to meet accelerators, crowdfunding platforms, business angel networks & VC firms keen to support both early-stage and growing businesses. 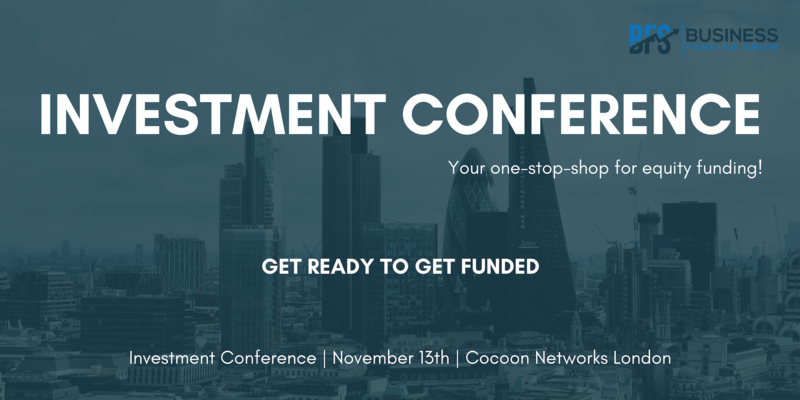 By collating the expertise of our panellists, the Conference will take you through the big picture of alternative funding, and how equity fits into it. We will also discuss debt and grants, and when entrepreneurs should consider utilising these in the life cycle of their companies, the importance of SEIS/EIS schemes, as well as when to stay away from funding altogether! British Business Investments – as the commercial arm of the British Business Bank, they provide supporting capital to both providers of equity, as well as debt finance. UK Business Angels Association – national trade association for angel and early-stage investment, representing over 160 member organisations and around 18,000 investors. EISA – not for profit organisation which exists to aid the provision of capital to UK SMEs through the EIS & SEIS schemes. Innovate UK – leading grant funding provider in the UK, supporting science and technology ideas that grow the economy. The panel will cover hot topics and trends of the funding world, including which industries and fields are currently on the rise; new developments in the private and institutional investment landscape; and the state of investment and government regulation in the crypto space. They will also map out the position of the UK market on the global business funding landscape, as compared with other key players to discuss what holds us back versus what drives more investment into the economy. This talk will throw a bit of a curve ball at its audience: does raising external capital from sources like business angels and VCs really constitute the pinnacle of the entrepreneurial endeavour? A big number of large corporations can attest to this. However, John Mullins will explain some of the criteria needed for entrepreneurs to create a purely customer-funded business. A vast number of businesses never take any external funding, and instead rely on their customers as a much more agreeable and hospitable source of capital. Find out if this could be you! Crowdcube – a leading equity crowdfunding platform for entrepreneurs of startups and growing businesses to connect with potential investors. Seedrs – a leading, pan-European, crowdfunding platform for investing in the equity of private companies. Microsoft ScaleUp – an accelerator programme designed for Series A startups, offering access to sales, marketing and technical support. Collider – MadTech accelerator supporting startups who disrupt marketing, advertising and commerce with incredible technology. Wayra – accelerator programme connecting the Telefónica network with technological disruptors around the world. This panel will cover the basics of the early-stage business journey, including how to gain traction and early customers, how to turn big corporates into potential customers, and how to get investment ready. The accelerators will talk about the support and potential capital that they can offer fledgling businesses, and exactly how they utilise their networks to help them. In turn, the crowdfunding platforms will talk about the specific benefits that crowdfunding can bring, including broad marketing opportunities, as well as some of the challenges that come with this, e.g. protecting a company's IP. No doubt, the panellists will also share some success stories, including unicorns Monzo and Revolut, who crowdfunded on Crowdcube and Seedrs respectively, and what made these companies stand out from their competitors. Angel Investment Network – with 30 branches extending to 80 different countries, AIN has over 1M registered members with around 180K angel investors and 840K entrepreneurs. Angel CoFund – £100M investment fund making initial investments of between £100K-£1M, alongside syndicates of business angels. SyndicateRoom – connects ambitious investors with the country’s most trailblazing companies, and has grown to have more than 100 high-growth businesses in its portfolio. Startup Funding Club – award-winning angel syndicate with a portfolio of over 100 companies, including major success stories. Business angels in the UK collectively invest an estimated £1.5B per annum and are the country's largest source of investment for startups and early-stage businesses seeking to grow. The panellists will give you an idea of what lies beyond the basics (pitch, idea, team) when it comes to dazzling an angel investor. They will discuss the different aspects and importance of due diligence, both on part of the investor and the business, as well as the right way to approach potential negotiations. Importantly, they will also cover how far entrepreneurs need to be willing to compromise between the capital and relevant expertise/network of an angel. A few other topics will include the exit strategy, how BA networks can facilitate international relations for their portfolio companies, and what to do when your partnership with an angel isn't working out. ScaleUp Group – provides services enabling founders to manage fast global expansion by providing talent, governance, corporate structure and funding. Nesta – global innovation foundation which utilises networks, funding and expertise to back new ideas to tackle the big challenges of our time. Edge Investments – invests in dynamic businesses guided by exceptional management, operating at the intersection of creativity and technology. Octopus Investments – part of the Octopus Group, which seeks to improve the lives of millions of people by transforming the industries they operate in. London Stock Exchange Group/ELITE UK – As LSEG's international business support and capital raising programme, ELITE UK is an ecosystem designed to help ambitious companies scale up, structure for growth and be more competitive in the global marketplace. VC funding is by far the most challenging of all equity funding options to obtain, with most VCs getting thousands of applications every year, and accepting only a very small percentage. The panellists will take you through their application criteria, and exactly what makes your pitch deck stand out from the crowd. How do things like traction, intellectual property and overseas growth markets effect your case? Find out when it's worth fighting for VC funding, and when it's better to raise other kinds of funding first. The panels and presenting speakers represent all the pillars of equity funding and beyond, with differing business models and networks, which will give our attendees a very comprehensive view of equity – why it's a great option, when to utilise it (and when to stay away from it). We hope that each and every one of you will find something of value at this event, while connecting with top investors and institutions which can put your business on a sure-footed path to growth!